From certain vantage points, the 23-acre North Meadow feels limitless. Its unique shape resembles a butterfly and creates natural corners and sightlines that invite and intrigue visitors to explore the undulating expanse. Complete with rocky outcrops and hilltops, the Meadow is an ideal place to pass a sunny afternoon. The North Meadow is also a popular spot for organized sports. In the spring and summer, it hosts seven baseball and five softball fields and in the fall it is home to six soccer/touch football fields. The brick building at the meadow’s southern end is the North Meadow Recreation Center, which is operated by the Central Park Conservancy and includes basketball and handball courts, an indoor recreation room, and a café. Visitors can also borrow a Field Day Kit, which includes a variety of outdoor toys and games to enjoy on the North Meadow. Please note: Each winter, North Meadow closes for the season. This allows our turf crew to provide much-needed care for the landscape, ensuring that it will be ready for the influx of visitors come spring. 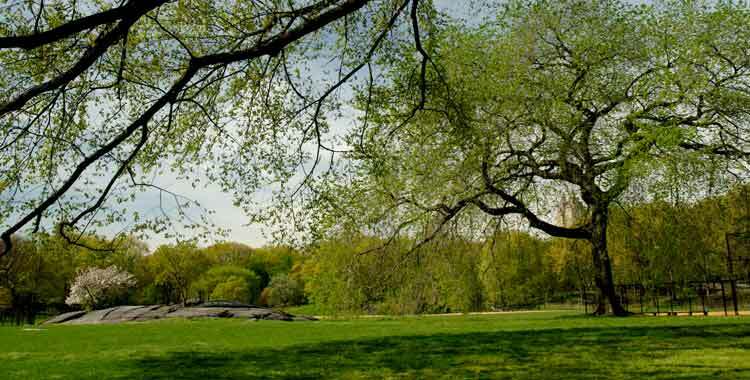 For specific information about when North Meadow will re-open in the spring, please visit the Alerts and Closures page or follow us on Twitter. Mid-Park from 97th to 102nd Streets.